Mechanically welded trolley on casters. 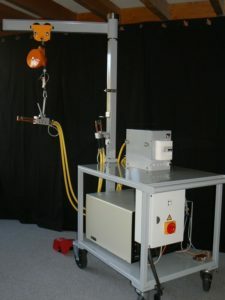 Fixed pole allowing maximum brazing height of 2 m.
1 m arm, swivelling through 360°, featuring two crabs and a balancer. Electrical cabinet with water flow controller (optional).